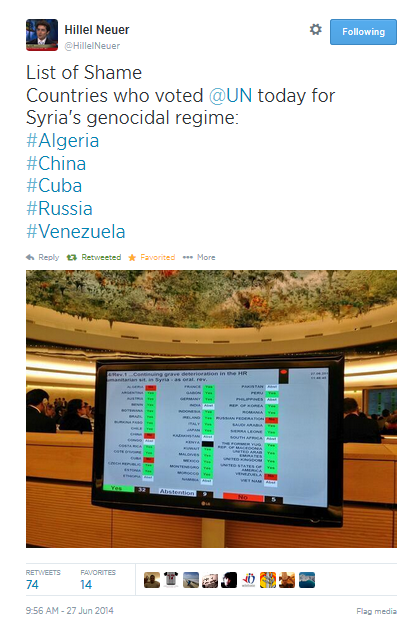 This was my immediate reaction on reading UNWatch's Hillel Neuer's list of shame tweet listing countries that backed the Assad regime on an important vote on June 27, 2014. Out of the five countries in the world who voted for the genocidal regime, the Castro regime in Havana had control of two votes: Cuba and Venezuela. This vote took place on the final day of the 26th Session of the United Nations Human Rights Council. That Raul and Fidel Castro would support Assad's regime in Syria is no surprise they have done it for decades and have also collaborated, and even violated international United Nations sanctions to smuggle arms to North Korea. The "voting twice"observation on the surface would be considered a joke, but unfortunately its only funny because it has a serious undercurrent of just so happening to be a factual observation. That two out of the five country votes backing Syria are under the Castro brother's control may be a surprise to some, but it shouldn't be. Moisés Naím in April 2014 explained how the Cubans came to gain control of Venezuela. It is ironic that the Castro dictatorship that has made a career out of exploiting anti-imperialist rhetoric has succeeded in turning Venezuela into a colony of its regime, leading to the phenomenon of Venezuelans burning Cuban flags in protest of the Castro regime's undue control of their homeland.